S&T GeoTronics is marking the 50th anniversary of Apollo 11 with an open source, Arduino-based functioning replica of the Apollo Guidance Computer display keyboard, or DSKY. Now, a Columbus, Georgia electronics company that has recreated World War II Enigma machines and specialized in "location-based entertainment" devices has set its sights on offering the Apollo Guidance Computer's (AGC) display keyboard as an open source, Arduino-based replica ready in time for the 50th anniversary of the first moon landingin 2019. The Display Keyboard, or DSKY — pronounced "dis-key" — provided the means by which astronauts interacted with the Apollo command module and lunar module computers, but it was little more than its name implied: a calculator-like keypad, a panel of backlit status lights and an electrically-lit digital display. The Apollo astronauts used the DSKY by entering two-digit commands, referred to as "verbs" and "nouns." The AGC, in turn, would execute the desired program and display the resulting data on the DSKY. S&T GeoTronics' DSKY replica can run the original Apollo spacecraft code, but if you don't have a command or lunar module to fly, it can be used for other purposes, too. "Just like the astronauts entered a Verb of 16 and a Noun of 36 on the lighted keyboard to display the time, you do exactly the same," writes the company. It can also be used to show your GPS coordinates or monitor the distance to a target, with speed and estimated time to arrival readouts. It can run count-up or countdown timers, or even be used to play music or sound recordings. "This is an ideal device to teach or to learn about space, history and programming," writes S&T GeoTronics. "Makes a fantastic prop in escape rooms. It also promises to have some appeal to collectors everywhere." The Apollo Guidance Computer display keyboard, or DSKY, inside the Apollo 16 lunar module "Orion," as seen pre-flight. 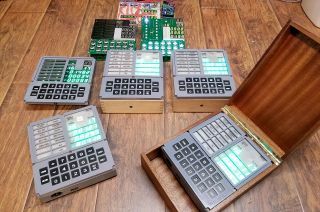 The crowdfunding campaign, which began on Friday (Jan. 26) on Kickstarter, offers a fully-assembled and operational DSKY replica, housed in a 3D-printed case and presented in a Mahogany wood box, for a pledge of $900. Limited to only 100 units, each DSKY also includes a velour carrying bag. For those who are looking something even more special to mark the 50th anniversary of Apollo 11, S&T GeoTronics is also offering to produce steel- and solid aluminum-cased units, limited to five each. Presented in Walnut and Purple Heart boxes, respectively. the steel edition is available for a pledge of $5,000, while the aluminum model is for those who back the project at $8,000 or more. S&T GeoTronics is also offering lower-priced kits, for those who own or have access to a 3D printer or who are "do-it-yourself-ers" and want to build their own DSKY. Depending on the components that are included, the kits are available for pledges between $40 for just the printed circuit board and $500 for the complete kit, with everything you need to assemble your own display keyboard. For $600, S&T GeoTronics will offer the DSKY electronics fully assembled, or for $700, provide the replica with a 3D-printed case. Assuming the funding campaign is successful and raises the $20,000 goal (or more) by the time it ends on March 3, S&T GeoTronics aims to deliver the kits and the completed DSKY units between June and August of this year. Despite it being a faithful and functional recreation of the original Apollo DSKY, S&T GeoTronics warns that it "in no way grants permission for the use of this device to launch unmanned spacecrafts and/or missiles" and that it "cannot be held responsible for any personal injury or loss resulting from the use of your DIY rocket or maker spacecraft with [the] device." Watch a teaser video about S&T GeoTronics' Open DSKY replica at collectSPACE.